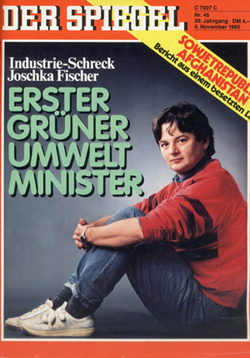 In the fall of 1985, the news magazine Spiegel featured Joschka Fischer as the first minister of the environment from the Green Party in the state of Hesse. The cover story set off fierce controversy because of Fischer’s radical activist background and his distinctly un-ministerial appearance in jeans and tennis shoes. He walks quietly, in sneakers, out of the supermarket. * The blue jeans are worn; the sweatshirt, red, is faded; the leather jacket, dirty. The man looks like a cross between a roadie and rowdy. His dog Dagobert circles around him. He is a fanatic marathon-debater, an agitator; he speaks with a bright, penetrating voice and a slight Frankfurt accent. His speeches are often interlaced with challenging thoughts. If he reviles and insults adversaries, it is done with great relish. There is nothing about Joseph (“Joschka”) Fischer, 37, that does not fit the typical, good citizen’s picture of a flipped-out revolutionary. And when, in the near future, the official car of the Minister of the Environment drives up to the Hessian state chancellery, there could be some confusion: the distinguished gentleman in the gray suit and tie – that’s the chauffeur. The fellow in the back seat who looks like an informant for the Ruhr valley bully Schimanski*** – that’s the minister. Some people can hardly believe it. A New Left activist – a Spont* – from the Frankfurt squatters’ movement, a Realo-Green** with a coarse proletarian attitude, a former drug user with a record, a man dressed in the baggy-look takes a seat at the cabinet table – as Minister for the Environment and Energy. Since the Hessian Green Party agreed to form a government coalition with Holger Börner (SPD), thus sealing the first eco-social coalition in a federal state, the political climate in Germany has changed. Businessmen, conservative politicians, and editorial writers are falling into line, as if there were a coup to defend against. *** A television police inspector – trans. * “Spontis” were leftist-activists who believed that the “spontaneity of the masses” was the key revolutionary element in history – trans. ** “Realos” are the pragmatic, “realist” wing of the Green party. The “Fundis” are the wing that holds to their fundamental principles – trans.